For the preliminary document as to how MMU x.x series can be a very efficient glue to bring the school districts and charters together, please click here at Lee’s pre-release of MMU proposals to districts-CMOs. To see the glimpses of what MMU series may be able to see the potentials of MMU to accelerate the CMO network expansions efficiently, please check the comparison charts between the districts vs. CMOs vs. star CMOs vs. MMU x.x series here. The saturation or shortage of the Teachers (especially quality math teachers) crisis, especially in the big cities. This is getting worse not just for the districts, but also the CMOs as the charter networks try to expand rapidly with the steep competitions of demands with far less supplies. Increasing difficulties to raise the math average and to reduce the math poverty: Math saturations stablized on both sides in almost all USA states, which make it difficult to raise the math average at the big district scales although things are far easier in the small districts. Their original intentions to help the poorest districts with the common goals (before the self-interest and competitions or vain prides get in) without which neither districts nor charters nor CMOs can for the next 10-20 or even 30 years. A lot of money wasted for the wishful thinking while the EDU budgets never seem to be enough. So, aside from the typical budget allocations and some conventional innovations here and there, what else can they do? NOTE: estimated charter student enrollment by 2016-2017 is over 3 Million charter students, which may be over 6% of the student population. The key super-star quality math impacts that can make both side overcome the feuds during the transitions. The basic ideas are provided in this overarching table that compares the districts, charters, super CMOs vs. the MMU1 math impacts. 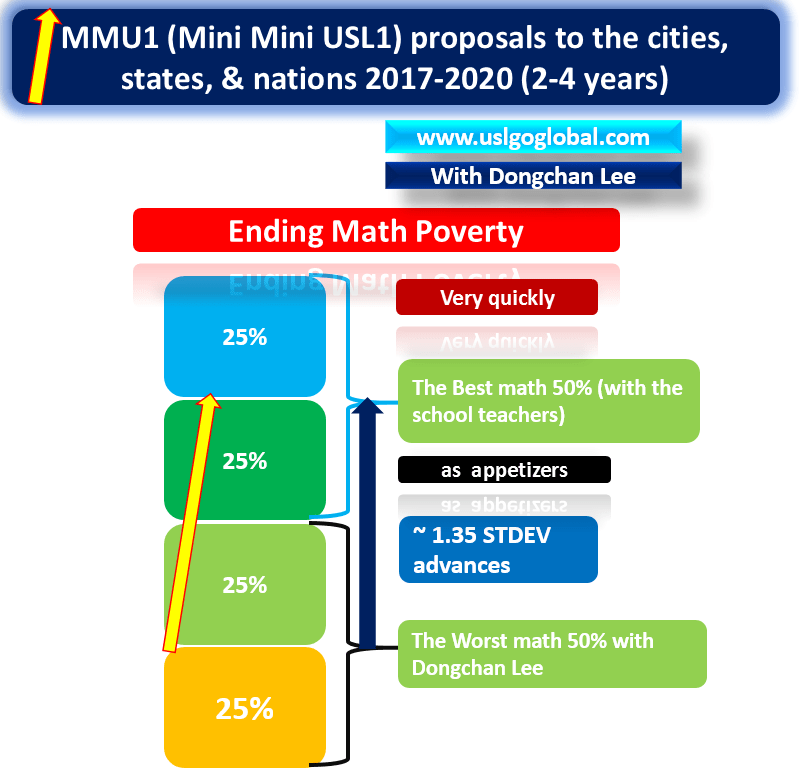 If they both rely more on MMU series, both the districts and charters can devote much of their resources on literacy, science and other critical EDU resources to much more quickly empower the poorest regions.